OBT is a clinical stage oncology company with a pipeline of immune-oncology and antibody-drug conjugate based therapies. OBT's commitment to the advancement of the field of cancer immunotherapy is focused on (i) the identification of novel immune check point targets, (ii) the optimisation of multiple antibody and bi-specific technologies for immuno-oncology and (iii) a broad clinical alliance for rapid testing in numerous cancer types. Our product pipelines currently consist of (i) T-cell based IO therapies, namely check point modulators and (ii) NK cell based IO therapies, namely antibody dependent cell mediated toxicity (ADCCs) and (iii) Antibody drug conjugates (ADCs). Our aim is to re-engage and recruit the body's immune system to attack cancer cells, providing a targeted treatment strategy to patients most in need. This has been enabled by the expertise of a team of world specialists in immuno-oncology and immuno-therapeutics. Together, we have established a unique insight into the cancer-immune cell synapse by building one of the world’s largest integrated oncology immune cell surface protein libraries. 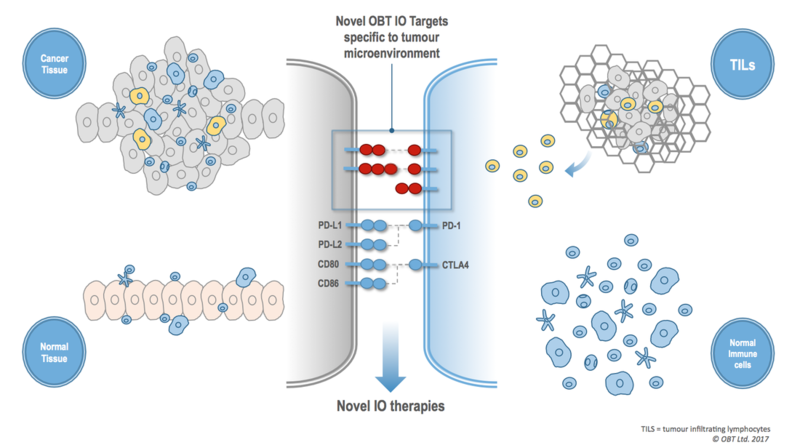 The figure below illustrates OBT's IO discovery process which has provided a unique insight into the cancer - immune cell synapse, highlighting a number of novel IO candidates for cancer therapies. Its compelling to think of the immune system in cancer for three reasons. One is the incredible specificity of the immune system. The second is that the immune system can adapt as the tumour changes. The third one is that you can get memory, and that's the hallmark of the immune system that doesn't exist for any other type of cancer therapy. Once you've generated T cells that can recognise cancer, you've got them basically for the rest of your life. Whereas with every other drug, they kill a bunch of tumour cells and then the drugs go away."